Sussex's County Championship season resumes on Sunday with Derbyshire welcomed to Hove for the first of six games that will decide whether Jason Gillespie's men can clinch promotion back to the top division (11am start). As the division two promotion race hots up, the side are well-placed in second place, six points ahead of third-placed Kent and seven behind leaders Warwickshire. Sussex go into tomorrow’s match on the back of a run of three Championship wins, two of them by an innings. Their last match – also at The 1st Central County Ground – saw Glamorgan bowled out in the 80s in both innings and resulted in victory by an innings and 154 runs. Tomorrow’s eleven will be selected from the same 13-man squad that was named ahead of that win. Luke Wright has come through Friday night’s Vitality Blast victory over Middlesex with only minor soreness in his lower back. 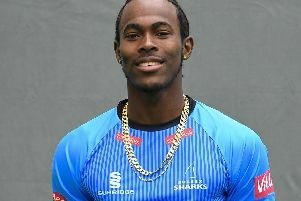 He is not included in this Championship squad, however, to allow him to continue his rehabilitation and prepare for Friday’s quarter final against Durham Jets. Derbyshire are sixth in the division with two wins, three draws and three defeats from their eight matches. The second of those victories came in their previous match, a 39-run win over Northamptonshire at Chesterfield.